Gregory Ivy came to Woman’s College (UNCG) in 1935 and founded the Department of Art. In 1941, with the help and support of other staff and community members, he established an art gallery, now the Weatherspoon Art Museum. A talented painter and an inspiring teacher, Gregory Ivy influenced generations of students, and shaped art education at UNCG. Ivy is also identified as an important mid-century modernist. Ivy was interested in an alternative approach to painting-to find basic lines and visual rhythms that felt like the forces of nature rather than copying them faithfully in a realistic way. Ivy used bold lines and big, broad strokes to convey the physical sensations he experienced. In 1938, Ivy established a summer art colony held at Beaufort, North Carolina which focused on landscape painting. 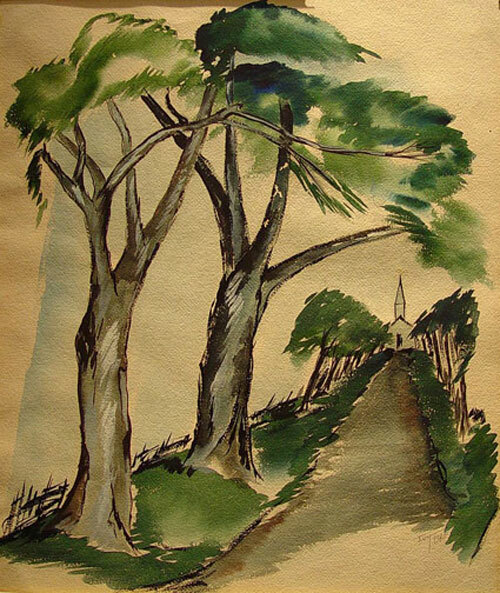 Dead End, Beaufortis a watercolor stemming from Ivy’s time in Beaufort during the summer session of 1940. Over the course of his long career, Ivy participated in exhibitions along side major artists such as Edward Hopper, Jackson Pollack, John Marin, and Marc Chagall at institutions including the Brooklyn Museum, the Metropolitan Museum of Art, Corcoran Gallery in Washington, D.C., and the Art Institute of Chicago. The Weatherspoon Art Museum houses a major collection of Ivy’s work.